A resident of Florida, Ms. Ade is the discipline chair for English at Embry-Riddle Worldwide. She has been with Embry-Riddle since 1992. She serves on the Worldwide Faculty Senate, COAS Faculty Council, and several committees. She also serves as course monitor/developer for GNED 104, ENGL 106, and ENGL 123. 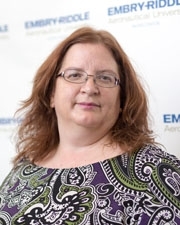 Ms. Ade has held various positions with Embry-Riddle Worldwide at Patuxent River and Joint Base Andrews MD campuses including Academic Advisor, Assistant Center Director, Center Director and Director of Academics. She previously taught high school English in Ilion, NY; wiriting, Englsh, and communication courses at University Maryland University College; and English courses at College of Southern Maryland. Any free time is spent talking with her adult son, reading, and traveling.